This year's Parade theme is "100 Years in Golden" and will be held on Saturday, July 27, 2019, at 10:00 am. The Buffalo Bill Day's parade has been a Golden tradition for almost 50 years, and we strive each year to make it a fun and memorable experience for both spectators and participants alike. One of the best Golden Colorado Events, our parade boasts over 70 head of horses, collectible cars, creative floats, fire and emergency vehicles, and several local performing and charitable groups. It usually takes about an hour for the approximately 70 different entries to pass by. We hope you will join us for the Buffalo Bill Days Parade! Please arrive early for the best viewing. Keep in mind that parking will be challenging and Washington Ave. will be closed for the parade. The parade route will be the same this year as it has been in years past. 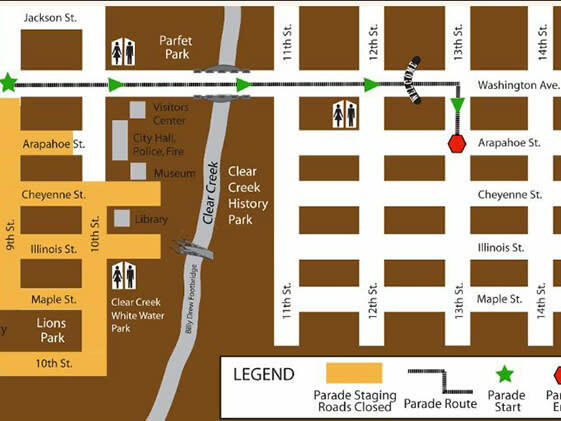 If you are new to viewing our parade, please see the website map to help guide you to the best viewing locations. We will have two parade announcers stationed on Washington at 10th Street and 13th Street to add to your viewing experience.